On Friday July 25 we finally left Tahanea, shooting out the pass at 6:30am. We had a rollicking good 50 mile sail dead downwind in 20 knots of wind to arrive at the SE pass to Fakarava Atoll just as the tide was turning at 1pm, which made the pass fairly easy. Strangely enough, we were by far the smallest boat there as we were surrounded by $Yacht$ - our Aussi friends on the $wan 57 'Cowrie Dancer', a 60' $wan from Sweden, and a cu$tom 60' ketch. All have dive gear and compressors and were happy to loan them to us, so we did a fun dive with them on the coral in the pass. Because of the rapid currents, the passes through the reefs usually have the best coral and the most fish, so we saw lots of fun stuff before the high-pressure hose to Chris's regulator blew a leak and we had to surface. Again, even thought we were the smallest boat, we hosted a party for the others in thanks for the loan of the gear. Sue and Amanda turned the last of our Tahanea spider-conchs into spicy conch fritters and Amanda was proposed to (yet again) over her Matrimonial cookies for desert. On Sunday Jon did yet another drift dive of the south pass and saw 50-60 4'-7' sharks and a couple of large (6'?) tuna-type fish. After lunch we wrestled our anchor out of the coral (with Chris directing us while snorkeling in the water) and motored out to the eastern end of the lagoon. There we anchored in 25' over beautiful sand in flat calm water with palm-lined motus in front of us. Over the next few days we explored ashore and even got out the sailing dinghy for more extensive exploration. French President Jaques Chirac was supposed to come to Fakarava on Tuesday, but even though he canceled this part of his trip the parties were still scheduled to happen. We actually missed the beginning as we were having fun checking out 1-2 somewhat deserted anchorages along the inside of the 25 mile long NE wall of Fakarava. The Fete itself went on for 5 days, with teams sent from many of the Tuamotu atolls. We had fun watching them race their 1 and 6 person outriggers, demonstrations of how to weave palm fronds, and an interesting competition called "Javelot", where contestants throw spears at a coconut stuck on the end of a 50' high pole. We also saw copra preparation competitions where contestants split 50 coconuts, dig out and bag the meats, and pile up the husks. But by far the most fun was watching the dancing in the evenings. Some atolls sent large and obviously well trained troupes. I didn't know hips could move that way! 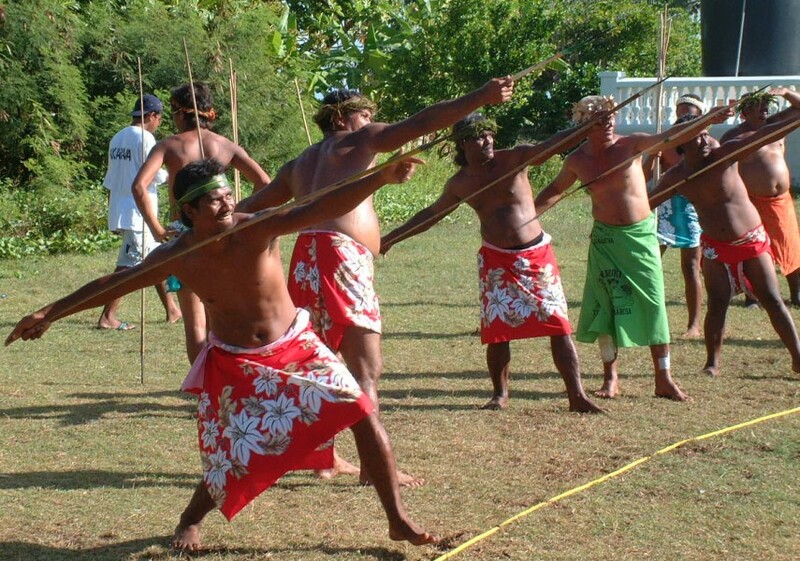 The Tuamotu culture doesn't seem as warlike as in the Marquesas, so the men's dancing wasn't as aggressive, but it was still fun. Several groups sang, which was pretty but all in Tahitian (I suppose) so we couldn't understand it. The costumes, all bright colors, palm fronds and shells (lots of shells) were fun as well. 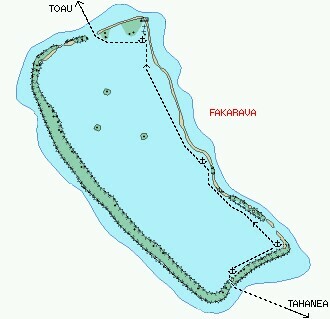 Click here to go to the Fakarava Destinations page.